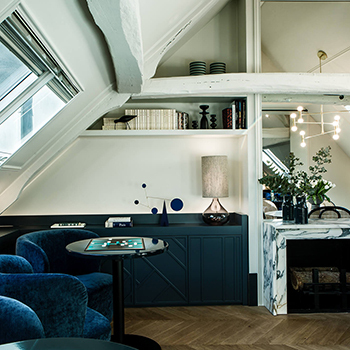 If you are looking for a Parisian pied-a-terre, then you are sure to be seduced by Maison Armance, the new 4 stars boutique hotel on Rue Cambon. To find it, stop outside number 5, which was home to Stendhal at the beginning of the 19th century. Today, the mansion is known as Maison Armance, in homage to the novel penned by the French writer. After opening the carriage door, walk through the typically Parisian porch and cross the peaceful courtyard. Let yourself be transported to another world. Take the lift straight to the top floor where your welcome awaits. Once you have your room key in hand, head to the floor shown and cross the hallway designed in the style of a winter garden, calling to mind the orange trees in the Jardin des Tuileries. Enter your room. The parquet floors and moulding, a common thread in an unfolding story, accentuate the furniture that has been specially designed for the space. Each room features an authentic prints whose finesse is sure to impress. The unusual layout of the reception on the 6th floor plunges you into the world of a French literary and artistic salon. The windows offer a unique view over the capital and transport you in a space flooded with natural light. Storm grey, zinc, brick red, midnight blue…the colour palette is inspired by the rooftops and skies of Paris, just like the works of painters. The selection of fine materials, such as tweed, velvet, brass and wicker, is a common thread that runs throughout the couture inspired interior. How would you define the world of Maison Armance? The creative process starts with the architecture, understanding the volumes and the space. As the build progresses, the concept begins to take shape: the story is written throughout the project. We felt that it was necessary to bring traditional touches to the hotel by working with the volumes. The interpretation of the concept must be simple and obvious without being clichéd. 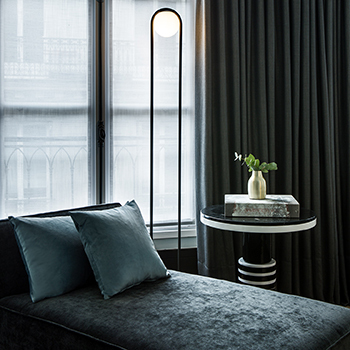 The hotel’s address, its reference to Chanel, have influenced the project, the work, the selection of materials, helping us to create a couture hotel. 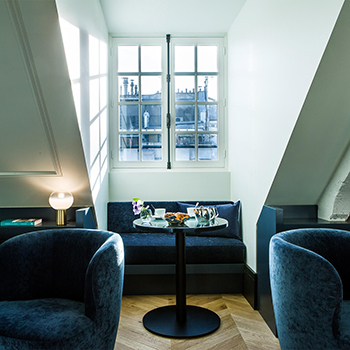 The hotel’s interior is styled on the “homely” nature of a Parisian apartment as well the idea of an intimate lifestyle. 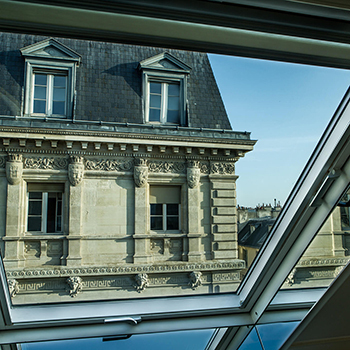 The hotel is intended to be, for each customer, their Parisian home, a place where they love to be. The first source of inspiration is the place, its history and its firm roots in the neighbourhood. We need to become absorbed by the spaces and respect the heritage in order to bring the hotel to life. Nothing can be taken for granted, we must constantly ask questions. The history of Esprit de France and the way in which it reinterprets the classic by adding value to places has also guided our thinking. For each of our projects, our sources of inspiration are varied and constantly evolve as we make new discoveries every day. They come together like a collection of art, from the works of the architect Kengo Kuma, to those of the architect and interior designer Joseph Dirand, through to the designer Isabel Marant, all to a backdrop of twentieth century influences, particularly Art Deco, Art Nouveau and Scandinavian design from the 1950s to 1970s. How did you create the decorative universe of Maison Armance? The spirit of the premises has been expressed through a refined universe, a mix of several styles created with four hands. We have created more than just style, but a warm place for living. The customer must immediately feel like they are entering a Parisian apartment. Their own. The hallway has been designed in the style of a winder garden to mark the transition between the outside and the inside of the hotel. 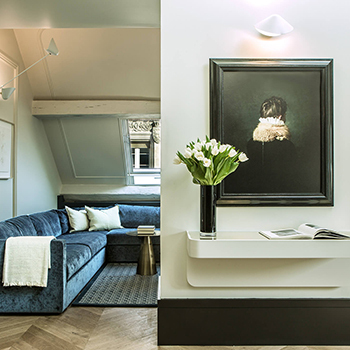 Each room features parquet floorings and sleek mouldings. The dining room, on the other hand, has been designed to resemble a literary and artistic salon, complete with large modular tables and a private lounge. What makes Maison Armance so unique? Maison Armance sets itself apart, first and foremost, by its hidden nature. The hotel’s entrance is not immediately visible. To find it, customers need to cross the typically Parisian inner courtyard which contributes to the air of secrecy and privacy surrounding this address. The second distinctive feature of the establishment is its unique configuration. Customers are welcomed on the top floor where they can enjoy views over the rooftops, with their head in the clouds.